I can forgive you if you have never heard of Adams. Despite being in the city centre it isn’t too well known and doesn’t market itself. The restaurant is affiliated to New College Nottingham and all the food is served and prepared by their current students. It’s open for lunch every day as well as Wednesday and Thursday evenings. On those evenings the menus are more ambitious and they have themed evenings such as Thai and Spanish. You can enter the restaurant off Stoney Street or St Mary’s Gate. It reminded me of a nice school dining room, functional rather than cosy and atmospheric space. We visited on an evening that wasn’t themed, these are billed as a 5-course tasting menu for £19.95. In essence, your choice is 3 courses with 2 nibbles added on – so describing it as 5 seems a bit of a stretch! Their wine list is surprisingly good though, not too many options but some appealing bottles that were well priced. We started with some sourdough bread. It was a nice touch but not great, the texture was wrong and it needed more seasoning. A small cup of soup then arrived purporting lentils as its main ingredient. It was a smooth texture and pleasant enough… though if you’d asked me what was in it I’d struggle to decipher. For my first choice of food I went for lamb koftas. The little balls were firm and meaty, neatly presented atop some carrot salad. I was suspicious of the sweet chilli sauce they were served with, obviously not in keeping with the heritage of the dish, but it worked rather well. There was a nice heat in combination with the cooling tzatziki that was also on the plate. The main course surprisingly led me to the vegetarian option; roasted celeriac, mushrooms, poached egg, grilled onions and hollandaise. Across the plate the cooking was good, poached eggs were very well done and vegetables just right. Whilst there was little to fault it felt a bit like a starter that was forced to be a main course. It was on the rich side too with the hollandaise and egg yolk both luxurious and creamy. 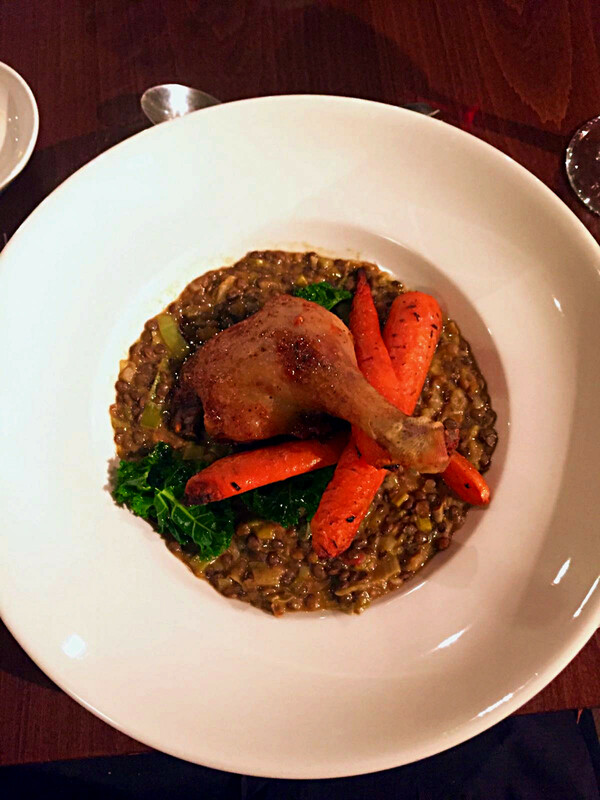 The dish of the evening was undoubtedly my girlfriend’s confit duck with braised lentils and carrots. Great rich, earthy flavours from the bird and pulses. Something you’d happily pay the best part of £15 for at somewhere like Bistrot Pierre. A pre-dessert was just a mouthful in the form of poached rhubarb and a sliver of crème caramel. No criticism in the technique or flavour of either but not a perfect marriage for me. Rhubarb and custard doesn’t need reinventing! For the dessert proper the options were a trio of cheeses or desserts. A little steamed pudding with a lemon curd sauce was first to catch the eye, the sponge could have been a touch lighter but I enjoyed the flavours. Ice cream with some red berry coulis was good and worked well for me with a rich chocolate tart, although the pastry was just a touch undercooked. The front of house was run smoothly by the students, they well drilled and polite. Occasionally groups of the students loitered to chat and have a giggle together in plain sight, endearing more than anything. I’m picking at straws though, we had some good food at a great price and supported the college in doing so. I can’t help but be impressed with the offering at Adams, especially with the food we got for £20. There was certainly space for improvement but the same can usually said about anywhere, let alone of aspiring chefs.